Almost since the beginning, El Corno had contact with Cuban poets and artists. In January, 1967 we visited the island for the first time, to attend El encuentro con Ruben Dario, a meeting of poets and critics honoring the 100th anniversary of the great Nicaraguan modernist. We brought back a large selection of new Cuban writing and featured it in this issue, which appeared in celebration of the country’s revolutionary holiday: July 26th. 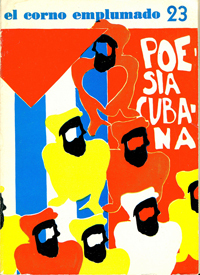 Among the Cuban poets in this issue are: Nicolas Guillen, Miguel Barnet, Francisco Garzon Cespedes, Roberto Fernandez Retamar, Guillermo Rodriguez Rivera, Pablo Armando Fernandez, Fayad Jamis, Luis Suardiaz, Eliseo Diego, Jose Lezama Lima, Nancy Morejon, Lina de Feria, Tania Diaz Castro, Belkis Cuza Male, Heberto Padilla, Felix Pita Rodriguez, and Cesar Lopez. Illustrations are by the Cuban painters Mariano and Posada, and the Cuban cartoonist, Nuez. Mexico’s Felipe Ehrenberg designed a striking cover, and would do a number of future covers for us as well. This issue of El Corno has an interesting history. We had published Cuban writers previously, and had also sold 500 subscriptions to the journal to the Pan American Union, the cultural arm of The Organization of American Statas (OAS). The Union objected to our giving a forum to Cuban writers, and threatened to cancel their subscriptions if we continued to publish them. We would not be bought, and they canceled their subscriptions. The journal continued its independent path.